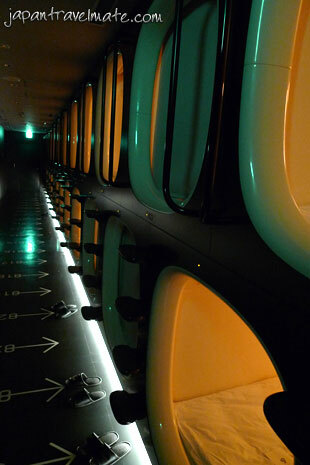 In the centre of Kyoto is the most amazing capsule hotel you’ll find in Japan. With an interior that looks like something out of Star Wars, positioned right next to the famous geisha district of Gion, this Japanese capsule hotel is a sleeping hub like no other… and it’s only 4,600円 (about AUD$50) a night. 9hours offers a refreshing innovative service concept focusing on the “value of time” in an urban area. It attempts to break down the well known, the traditional notion of hotel service and stay. We attempt to introduce a functional accommodation experience in an unprecedented manner for those who seek practicality and special aspects in a hotel stay. You can stay here for a maximum of 17 hours. You can check in anytime. Kyoto map, even information, Kyoto city one-day bus pass, JTB Tour applications, internet and even free lending of an umbrella! All surfaces are sleek. All signs are part of the walls and floors. 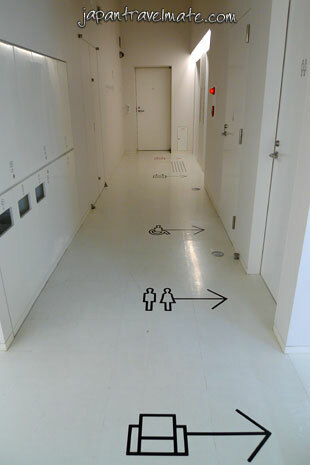 Minimal icons are used to guide you around the hotel. A simple colour scheme of white, black and silver serves to enhance the uniqueness and uncomplicated functionality of the hotel. Lobby area (reception is behind) with elevators up ahead. 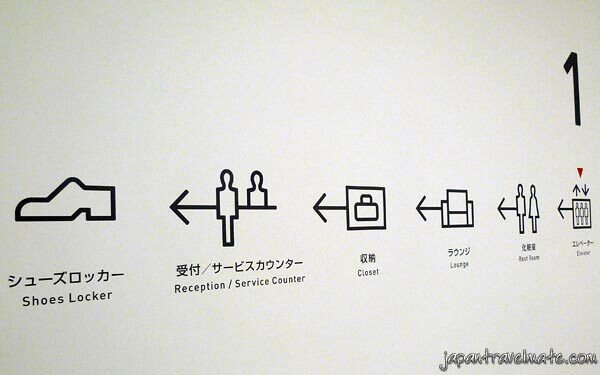 Most signs in Japanese hotels will be in English and Japanese. Having a background in design – I’m a huge fan of Japanese design and how user friendly it always is… even without language, this image makes sense. After checking in you’ll probably head straight to the locker and shower area. Men’s and women’s locker and shower areas are on separate floors. There is a public bath and private shower cubicles. Just like every other Japanese capsule hotel, you’ll find razors, combs, toothbrushes and hairdryers. The locker is a decent size, large enough to fit a small suitcase or a large backpack. 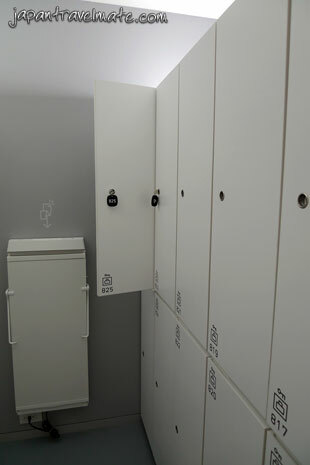 Lockers in the bath/shower area. 9hours creates an experience with their brand. All the toiletries, and even coffee and bottled water, have been made especially for the hotel. 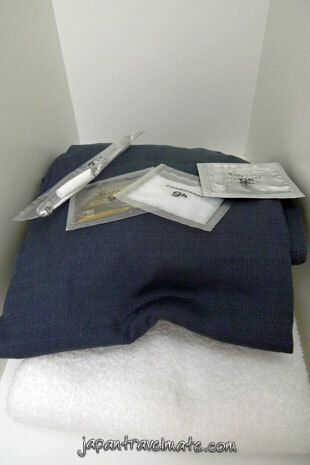 A yukata, towel and 9hours branded toiletries in your locker. If you’re thinking you need to choose the best time to visit Japan for a comfortable stay in a capsule hotel, you need not worry with hotels like this. Even in the coldest winter and sweatiest summer, yukatas are all you need for comfort. 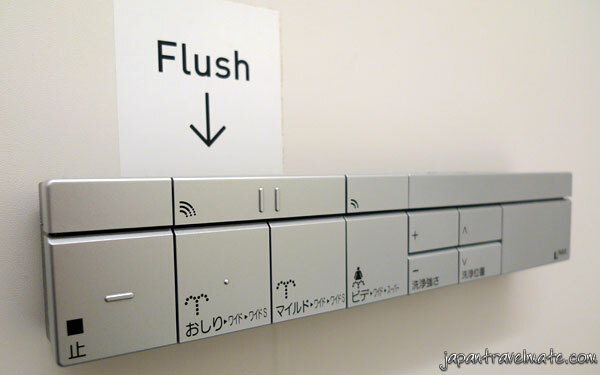 You know what a toilet looks like – but have you seen a control panel for a toilet like this one? As well as the showers being on separate floors, capsule rooms for women are on different floors to the men. There are toilets and vending machines on every floor. 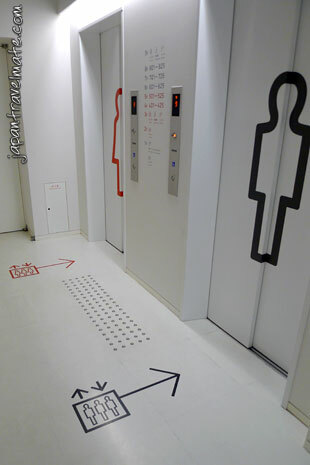 Men and women’s capsules and bathrooms are located on separated floors accessed by separate elevators. 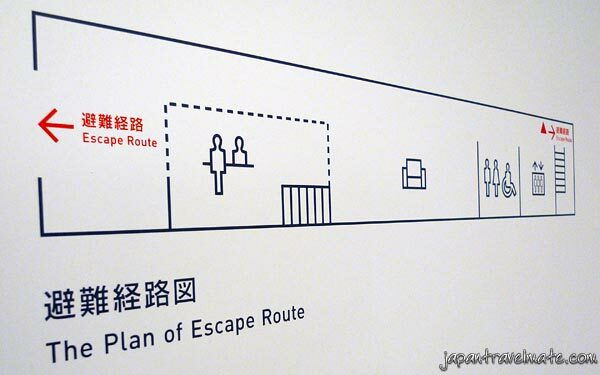 Another cool graphic on the walls inside the capsule hotel. After going up the elevator and through the small, very plain room with only a vending machine and a toilet door, you enter the capsule room. There are about 20 – 25 capsules on each floor. If you’ve ever stayed at a hostel in London, you’ll know that it can be fun to hang around the 15 other people in the room – but in such a closed society like Japan, you get privacy literally by being encapsulated! The eerie gold and green lighting illuminates the entrance to your capsule. Locate your capsule and jump in! There is a sliding blind to give you privacy. The entrance to your 9hour sleep system. Inside the capsule is a very comfortable mattress, a pillow custom made for the hotel, and a control panel for lights and the alarm. Unlike other capsules, there is no TV inside – which I like, it only takes up room and distracts from relaxation. 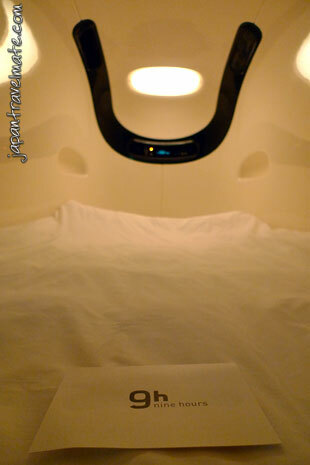 At the foot of your capsule bed are instructions on how to use the hotel and sleep system. The “Sleep Ambient System” is designed to help you sleep better. Setup your wake up time and start the system. 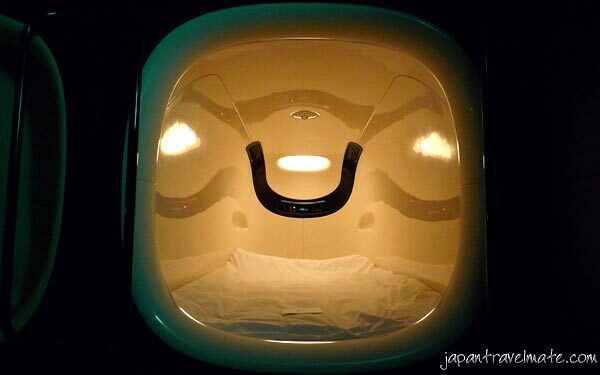 The lighting in the capsule dims gradually to make falling asleep easier. 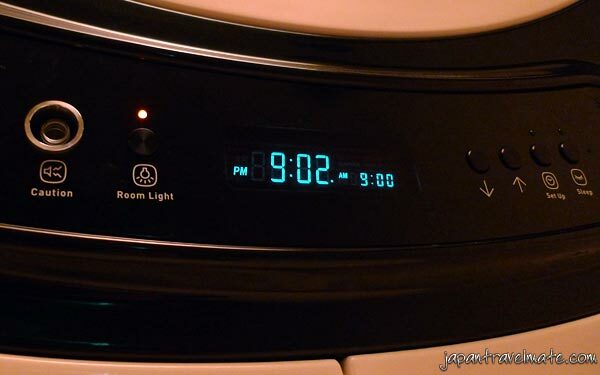 The next morning as your wake up time approaches, the lighting slowly becomes brighter to help you wake up comfortably. Control panel inside the capsule to set the alarm and room lights. True to the nature of the interior, the exterior of the building is very simple. 9hours Capsule Hotel from the street – tall thin buildings are typical of inner city Japan. The really convenient thing is that you can check in at anytime and start your 9hours. I first stayed at 9hours during a sweltering few days in August during my summer holiday travelling Japan. I checked in around 8PM and checked out before dawn to walk along the Kamo River. I’d recommend staying here when you’re travelling solo or in small groups. 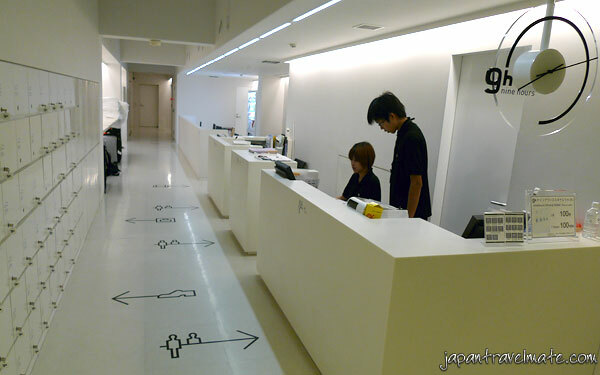 The 9hours.jp website is bilingual and you can make a booking directly through their online reservation system. Payment is made upon arrival. Train from Kyoto Station: Take the Kyoto City Subway Karasuma Line for 3 minutes, getting off at Shijo Station. From there find the Hankyu Kyoto Line at Karasuma Station, heading to Kawaramachi Station which is just 2 minutes away. Bus from Kyoto Station: I’m a big advocate of the 500円 all-day Kyoto City Bus Pass – but when I stayed at 9hours, I took the train there and walked all the next day. If you want to take the bus, the easiest way is to ask the staff at the information center inside Kyoto station. From memory, I know the 203 bus goes along Shijo Dori – just get off at Kawaramachi Station. After getting off the train, take any of the western exits up to the street. There is a main road called Shijo Dori – you want to get yourself on the sidewalk on the south side of this road. You’ll see a MOS Burger and a McDonalds along here. Walk west along this road, past the MOS and McDonalds. After McDonalds, turn left at the lights – you’ll be walking down a one-way street against traffic. After 100 metres you’ll see a Family Mart convenience store – 9hours is next to that! The Golden Pavilion – Kinkakuji – UNESCO World Heritage Site. Kyoto’s Castle – Nijojo – UNESCO World Heritage Site. Fushimi Inari – mountain shrine with thousands of red gates – UNESCO World Heritage Site. Kyoto Imperial Palace – National Heritage Site. Next time you visit the Kyoto area, spend a night at 9hours and let me know how you like it! 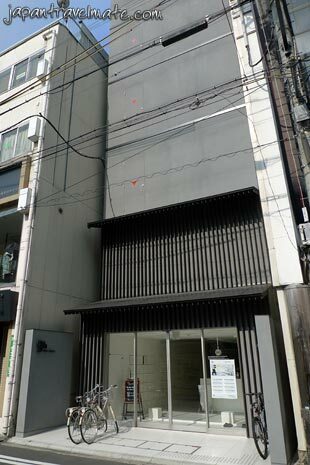 The hotel is very close – only about 2 small blocks – from Kawaramachi station. If you’ve arrived at JR Kyoto station and are visiting Kyoto and spending the day seeing the sites before checking in to 9 hours, buy a 500 yen all-day bus pass. Catch the bus from JR Kyoto station to Kawaramachi station. Leave your bags at a locker at the station. Toiletries are unnecessary! When staying here, shampoo, conditioner, toothbrush, toothpaste and body soap are provided. This content has been republished from Inside a Modern Designer Capsule Hotel: 9hours, Kyoto with permission from its author Dean Wormald. This work by Japan Travel Mate is licensed under a Creative Commons Attribution-NonCommercial 4.0 International License.